Currently the obsession with organic and natural ingredients has reached a new peak.Maybe its awareness, maybe it’s availability.But whatever the reason might be, it’s something to rejoice.Because skincare had always come with the heavy baggage of scary chemical lists.Not anymore.With a plethora of brands being launched claiming to be organic, 100 % natural and chemical free, the baggage has been lifted.And so you can imagine my delight when I got to test out one such product, specially since the Indian beauty market lacks in such amazing skincare products. I received their most famous product the Liz Earle Cleanse & Polish Hot Cloth Cleanser which I’m simply dying to try out.The package also contained a sweet note, some literature and brochures and since most of you know how I love reading about beauty stuff with my cuppa chai, you might have guessed at my excitement. The cleanser came with a couple of muslin cloths and instructions on using it.All cosily wrapped in a cute green pouch. 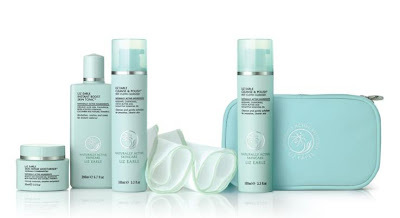 So while I’m trying out the cleanser read on to find out why Liz Earle is next on my hit list. High quality and naturally safe ingredients. Use of premium natural source Vitamin E as opposed to synthetic Vitamin E.
No animal ingredients which makes the products suitable for vegetarians.And yeah no animal testing either.(Hooray). Only mineral sun filters used to provide best broad spectrum UV protection and to reduce the risk of skin allergy. No mineral oils used.Which means these products promise never to break out your skin. No genetically engineered or modified ingredients used. Use of organic ingredients whenever possible. Most of the formulations are preservative-free, and whenever its necessary to use them then low concentrations of highest grade broad spectrum preservatives are used. Essentials: Contains the basics of skin care Cleaning, toning and moisturizing. Superskin: A potent blend of natural ingredients to help mature and aging skin. Eye Treatments: To help brighten and smooth fragile skin around the eyes. Problem Solvers: Trouble shooters for clearer, softer skin. Bodycare: For healthier looking skin from top to toe. Handcare and Footcare: Give your hands and feet the much needed love and care through these products. Energise: Stimulate your senses and energise your body and mind through my personal favourite range.Consists of a cleansing and exfoliating products to give you visibly smoother skin. Suncare: To help protect, moisturize, soothe and nurture skin in and out of sun.And the best part about these products is that they are formulated from mineral sunscreens. Naturally Active Men’s Skincare: Hard-working, men’s products to make a difference to the skin’s look and feel. Naturally Active Haircare: Consisting of Botanical Shine Shampoo and three high performance conditioners to leave hair detangled, glossy and ready to style. Head over to their website and check out their Springtime must-haves offer and receive a free Cleanse & Polish 100ml and a stylish beauty bag when you buy your three daily essentials.